These are the organization’s stated values. This first culture is an illusion created to attract profit and growth. It sounds nice, but it doesn’t really exist. 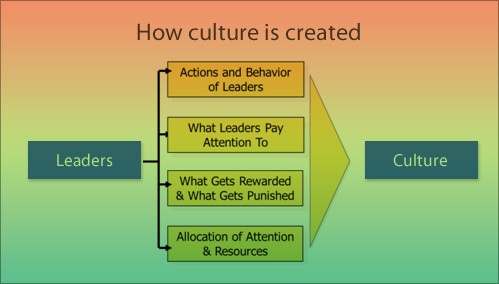 The second culture, the real culture, is the one that exists internally in the organization. And this ultimately is defined by the people in leadership positions – what they do, say, and are – and is revealed by who gets – and stays – hired, who gets promoted, and who gets fired. These are the organization’s real values and its real culture. And the difference between these and the stated values and culture is often as stark as the difference between day and night. The people in leadership positions in organizations define the culture and the values by their actions and their words – in other words, by who they are and what they do. Everyone else in the organization looks at those in leadership positions and either adapts to or rejects the culture and the values those in leadership positions espouse and embrace by their actions and words. If those in leadership positions are dishonest, the culture and values of the organization will become dishonest, sometimes subtle – and almost undetectable – and sometimes overt, and most employees will follow suite. If people in leadership positions are petty, gossipy, and cliquish, the culture and values of the organization will become one of pettiness, gossip (rumors, tattling, and outright lies, at times), and clique formation. If organizations have people in leadership positions who got their positions, not because they have the skills and experience, but because of who they know and what they know (all organizations have many skeletons in the closet and often the people in leadership positions have intimate knowledge of that and their positions ensure their silence), then the culture and values of that organization will result in employees currying favor and learning and keeping secrets for a price (there’s always a price). How are these organizational cultures and values revealed? It’s simple. In who organizations hire, promote, and fire. There are four types of employees in any organization. The real culture of the organization is revealed in which of these employees is hired, is promoted, or is fired. Competent jerks are those employees within the organization who treat everybody else – except those in leadership positions (you will often find that competent jerks are also the same people who become a different person toward those in leadership positions, and who are constantly sidling up to whoever they think is most powerful in the organization and discovering and keeping the organization’s secrets) – like mud on their shoes. They ooze disdain and often are very overt with their condescension and hate (because that’s what is behind being a jerk) of their fellow employees. In other words, except for those in those leadership position positions, competent jerks treat everybody else like dirt. But because of their two-faced natures – the jerk to fellow employees and the nice guy or gal to those in leadership positions – and their competence, which they make sure to highlight to everyone at every opportunity (to listen to them spouting loudly and continually about how wonderful they are at absolutely everything, it’s not hard to imagine that they believe they are God and they created the heavens and earth and everything in it), they are routinely hired and promoted in organizations. The other person who is routinely hired – and, while not promoted, also not fired – in organizations is the incompetent nice guy or guy. This one I don’t even profess to understand, but without fail, these people exist – and manage to stay employed – in every organization that exists. Incompetent jerks are the one employee type that tends to walk a 50/50 line in organizations. When organizations have a dishonest culture, a petty, gossipy, and clique-forming culture, and/or a who-you-know, currying-favor culture, incompetent jerks stand a pretty good chance of being hired and retained, if not promoted. This is because jerks, not matter whether they are competent or not, serve a useful purpose in organizations with these kinds of cultures and values. They are in the middle of everything, keeping things stirred up and off balance, and they are the eyes and ears (in the military, in basic training, these are the recruits known as house rats) of those in leadership positions. Ironically, though, the one type of employee most likely not to be hired, not to be promoted, and to be fired in organizations is the competent nice guy or gal (these are the people who are becoming quintessential leaders in who they are, what they are, what they do, and what they say). Because although the competent nice guys and gals exhibit the culture presented in external communications and the motivational sayings hanging on the brick-and-mortar walls of the organization, they represent a big threat to the real culture and values of the organization. They do their jobs, no matter what else is going on (and, often, in spite of obstacles and obstructions constantly placed in their way by both the competent and incompetent jerks in the organization), keep their heads down literally and figuratively (silence is a virtue), and refuse to engage in or be a part of the real organizational culture. In any group of people that identifies itself as a unit, conformity and participation is most highly valued. When there are people who do not conform and who do not participate, they represent a threat to the cohesion of the group. It doesn’t matter whether the people refusing to conform and participate are doing it for the right reasons (i.e., because the real culture is bad, wrong, or corrupt). If someone refuses to join in, then they will not be hired. And, if occasionally, one of these competent nice guys or gals does get hired, they will not be promoted. And, sooner rather than later, they will be fired. As quintessential leaders, we are tasked with creating, by example (who we are: what we do and what we say), a culture that is full of integrity and that is the same on the inside of the organization as what we portray to the outside world. Our real culture must match the culture we say we have. It can’t be based on dishonesty, on being gossipy, petty, and clique-forming, and on curry-favoring and the-who-you-know organizational structure. We must not allow jerks, competent or incompetent, to be a part of our organizations. We all end up with these types of employees, from time to time, because sometimes jerks can hold it together long enough to not be jerks during the hiring process. But once their facades disappear, we must take swift action to remove them. Competence, in this case, doesn’t matter. The damage jerks do to organizations and to other employees is far greater and far worse than any competence they may have. Additionally, on occasion, we will hire incompetent nice guys and gals, sometimes just because they are nice guys or guys (this is very common in organizations where jerks represent the majority of employees). As quintessential leaders, it is our responsibility to build and grow highly-competent teams. Sometimes – and I’ve had this happen from time to time – an incompetent nice guy or gal can become competent because they want to be and because we’re invested in the coaching process and willing to spend the time and effort with someone who is as invested as we are. But sometimes incompetent nice guys and gals aren’t really interested in becoming a competent part of the team. When that becomes obvious – and it will quickly in how they respond to constructive criticism and hands-on coaching – we must take immediate action to remove them. If that sounds harsh, consider the effect of not removing them. The rest of the team ends up carrying that person’s responsibilities and that creates resentment. Not removing them also sends a message to the rest of the team that effort and competence doesn’t really matter, and often you’ll find that everyone on the team starts slacking off and doing less than what they were doing before. It’s impossible to motivate a team when there are incompetent people allowed to stay on. Eventually, it effects projects, goals, deadlines, productivity, and finally profits. That’s how serious incompetence is and why it must be eliminated as quickly as possible. And those competent nice guys and gals? As quintessential leaders, these people should be filling our organizations and being promoted within our organizations as they grow into quintessential leadership as part of our teams. Take a long, objective, and critically-thoughtful look at the organizations you consider yourself a part of (not just where you’re employed) and assess the culture and values they promote externally and the real culture and values that exist within them. Are they the same? Are they different? If they’re different, does the internal real culture and values look like the ones we described above? If it does, where do you stand in relationship to that? To put a fine point on it, which employee type are you in those organizations?